Lachlan Murdoch’s unfinished business | Trust the Toffs! And I get that he’s keen to show with James as co-chief operating officer at Fox that he’s not one to favour one of his children above the other, unless it’s one of his four daughters. And that Lachlan is warm and personable, loves newspapers and is by far the most likable of the Murdoch scions. If you were going to spend time with any of the Murdoch clan, Lachlan is one you’d go for. Every time. But running $US85 billion corporations is not only about being warm and companionable. I’ve written my share of critical stories about Lachlan but I’ve also had some ambivalence. He has always faced impossible dynastic expectations. Coming after a father like Rupert, it’s impossible to exceed, the only realistic aspiration is not to fail. BRW magazine ran a story about him in its Rich List issue in 2011, which Lachlan I’m told privately cited approvingly as the first positive profile of him run by Fairfax Media. And then he realised it was written by me. 1. Internal critics: “Didn’t they massively polish a turd with LKM’s press release!? Entrepreneur, REA, 2/3 of revenue, directly responsible, etc. Classic.” This was the first response to Lachlan’s appointment from a source familiar with News Corp’s US internal politics. When Lachlan was deputy chief operating officer of News under Peter Chernin, there was nothing but official praise for his many talents. It was only after he left News in 2005 that a darker picture emerged of how he was perceived. According to Michael Wolff, Chernin took to describing Murdoch’s children as “the cretins”. Now Lachlan is back in the fold and it turns out he’s a complete hero. Everyone at News says so. At least in public. 2. Bad geography: Lachlan has said he will remain living in Sydney and fly to the US one week a month. There is some sense in this for News Corp, which has two thirds of its assets in Australia, where Lachlan has lived for the last nine years. It’s disastrous for heading 21st Century Fox, a company which exists by producing film and video content tapping the cultural memes of North America and Europe. This can’t be under-estimated. This is so not a good idea. 3. His Australian advisers: It’s not just the time zone. In Sydney Lachlan is trapped inside the News Corp Australia ghetto. News is the 800 pound gorilla of the local media scene, but its corporate culture is obsessed with seeing itself as the put-upon outsider, locked in an endless turf war against its enemies. Just who these enemies are varies, but the default option is the independent Fairfax Media and the government-owned ABC. Lachlan is caught behind the lines of this conflict. So his confidants are uber-right cultural warriors like Andrew Bolt and Piers Akerman who make Roger Ailes look like a liberal. It’s the complete opposite of the Cool Britannia set that his siblings James and Elisabeth identify with. It’s hard to imagine Rupert Murdoch moving against former News Australia chief Kim Williams last July without Lachlan’s input, or importing Col Allan, the man Lachlan picked to run the New York Post in 2001. In this sense the rabid anti-Labor coverage by the News mastheads in the federal election—the headlines Let’s KICK THIS MOB OUT”, the dated adaptations of scenes from Hogan’s Heroes to characterise Labor politicians—should be understood as having, to a greater or lesser extent, Lachlan’s imprimatur. 4. Unfinished family business: There’s a feeling that there is another shoe still to drop here, that this is a private Murdoch family arrangement about who gets to run the $US86 billion empire. They just haven’t got around to telling us the rest of it yet. We’re told that Lachlan’s return as co-chairman was worked out over six months. Gabriel Sherman writes in New York magazine, “On Monday, March 24, Rupert convened his board of directors for a secret conference call to make Lachlan’s return official.” Succession planning for the CEO and the chairman is the most critical role a board has, and they did it with a conference call two days before it was announced? Perhaps that’s unfair, perhaps this was all thrashed out long before. But there is a strong suggestion that despite the new titles for James and Lachlan, News and 21st Fox will carry on pretty much unchanged. Because if either of these appointments is a real one, then the new arrangements are probably unworkable. Then there is the perception of the baggage that Lachlan carries with him, dating back to the 1990s. 5. The idea that he doesn’t take advice. In the 1990s Lachlan, then in his mid-20s, replaced the head of News in Australia, Ken Cowley, who left him with a solid bunch of senior advisers who could make up for Lachlan’s lack of management experience. Lachlan dumped most if not all of them, and replaced them with younger faces. One.Tel had three flags that it was a dumb place to put money. First it was an Optus reseller with a terrific plan to start a 3G network but it didn’t have the spectrum licences to do it. When it finally did get some spectrum late in the day it had to pay so much for it that the business plan was doomed. Second it was run by persuasive operators who had shown a decade before they didn’t have the execution skills for a major business that had grown quickly. What they did at One.Tel was uncannily similar to their failed 1980s business. And third, they kept changing their accounting technique to hide how much money One.Tel was losing. I wrote this, as did a string of other Fairfax Media journalists. The Australian Securities & Investments Commission picked up on my piece and forced One.Tel to write off $173 million in capitalised costs. News Corp just ploughed in another$340 million. It’s arguable that Lachlan was similarly dismissive in 2008 of sceptics of his unsuccessful $3.3 billion bid for Consolidate Media Holdings that would have lost more than $1 billion. Lachlan Murdoch: I was a senior executive vice-president, I think was my title at the time, of News Corporation, and a director on the board. Q. Insofar as that company – that is, News Corporation – was entering into dealings with One.Tel, weren’t you intimately involved in those matters? LM: I don’t recall these discussions on UK spectrum, so – I’m sorry. Q. In late March 2000 you were on vacation on a yacht, weren’t you? LM: I don’t recall, I’m sorry. Q. Do you remember a yacht by the name of Tara? LM: No, I don’t, I’m sorry. Q. Can I show you a copy of a facsimile. LM: It sounds nice, though. Q. (Shown to witness). Did you have somebody working for you by the name of Tara at about that time? LM: Working for me by the name of Tara? Q. Do you see that it is addressed to Lachlan Murdoch care of Tara? LM: I don’t recall someone working for me by the name of Tara. Q. Do you see that it is a facsimile addressed to you from Mr Rich? LM: I’m just finding it here. Yes, I do. Q. It provided details as to the auction update in the UK, didn’t it? 18 Q. You will see that the facsimile records that £1.8 billion had been committed? Q. You will see that there is a handwritten note, apparently from Mr Rich, on the facsimile about having had a discussion with “Rupert”? Q. And recording an agreement between Mr Rich and your father that they would bid to a £2 billion limit? Q. Do you remember getting this fax? Q. Do you remember being told the information contained in this document? Q. Do you see on the bottom there is a reference “3/30 fax to Lachlan on vac”? Q. You were on vacation at the time, weren’t you? Q. Can I show you a copy of your diary for 29 March 2000? Q. (Shown to witness). You will see a reference to yourself being on vacation in a charter yacht? Q. Does that assist your recollection? LM: No, it doesn’t, I’m sorry. Williams: Shortly before that time you had been holidaying in Tahiti, hadn’t you? LM: I believe so, yes. Q. Mr Rich opened the email in a colloquial fashion by asking “How was the hula?”? Q. Whilst you were in LA in late April 2001 you went to see a baseball match, didn’t you? Q. In the discussion that you had with Mr Rich I suggest he asked you whether you’d received his email; do you remember that? Q. I suggest that you said that you hadn’t seen his email yet, that you’d get your secretary in New York to find it; do you remember that? Q. And you said to him, “Jodee, I can’t talk, I’m off to the baseball”? LM: I don’t remember, I’m sorry. Q. You told him that you would call him on Sunday evening when you got back to New York, didn’t you? 7. His great triumph: Pamela Williams’ book Killing Fairfax published by HarperCollins tells how Lachlan in late 2000 made an inspired $2.2 million investment in an Australian online real estate venture called REA. In 2005 he arranged for News to launch a takeover bid which left it with 60 per cent. It turned out to be a bonanza. By mid-2012 when News Corp decided to split into two companies, the REA shareholding was worth $US1 billion. Chase Carey and James Murdoch wanted to sell the REA stake but Lachlan convinced first his father and then the News board to hold on to it. Today it’s worth $US3.5 billion. Bravo! It’s a company-making move that has to be applauded. How much of a role did Lachlan play in the initial investment? Williams’ account glides over what seems a substantial role by News Australia CFO Peter Macourt in structuring the investment. And the move needs to be seen in the light of Lachlan’s court testimony of his activities at that time in regard to One.Tel, as an indication of how much attention he was paying to major Australian operations, let alone speculative online ventures, while he worked in New York. 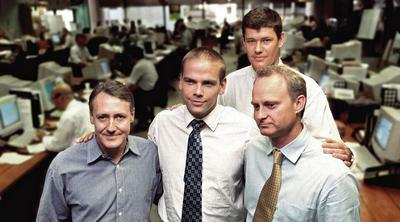 The takeover bid in August 2005 was days after Lachlan resigned from News. The eventual, investment in REA was about $110 million. Dd Lachlan talk his father into holding on to REA? That’s what they told Williams. But News Corp has made curiously little of what was clearly a masterstroke. It’s puzzling. 8. He has unlucky timing: Lachlan left News Corp in July 2005 and set up his private investment company Illyria. But he kept his powder dry. When Illyria opened its offices in November 2006 News Australia chief John Hartigan said, “Frankly I’ve got absolutely no idea” what Lachlan’s new business interest was. (i) In January 22 2008 Lachlan and James Packer unveiled a $3.3 billion bid for Consolidated Media Holdings. Fortunately Lachlan’s backers later pulled out and the bid failed. By October 2008 CMH was trading at $1.5 billion, or $1.8 billion less than Lachlan had been prepared to pay for it. News bought CMH in November 2012 for $1.9 billion. (ii) Lachlan invested $15.6 million in regional TV group Prime Media in April-May 2009 and sold out for $22 million in March 2012. Nice but too early. Today it would be worth $33 million. (iii) In February 2007 Lachlan received $US100 million of News Corp A stock as part of Rupert’s distribution to his children. The smart move was either to sell immediately (as Elisabeth seems to have done) or to hold them long term. Lachlan waited until late 2009 when he sold the shares at the low point for $US55 million. Today the stock is worth $US160 million. (iv) Lachlan used the share sale proceeds in December 2009 to buy a half share in the NOVA radio chain from the Daily Mail Group for $53 million. He bought the second half in 2010 for a reported $100 million. Operating cashflow has jumped from $5 million in 2010 to a reported $25 million last year. News Australia titles have suggested the company is now worth $600 million. On reported earnings to 2012 this seems wildly optimistic but the two years since then may have transformed the company. It’s Lachlan’s most solid success, and it is the one media investment that his family has no experience in. He does have a solid CEO in Cathy O’Connor. (v) In November 2010 Lachlan began what would be a $167 million investment in the Ten Network. The network’s strategy based on sport and news was derided by Lachlan and his partner James Packer. Ten has just recorded its worst prime time ratings on record, with a 13.8 per cent share behind Seven on 33 per cent, Nine on 31 per cent, and the government-owned ABC on 17.9 per cent. Its strategy has moved back to a focus on sport and news. Lachlan is down $103 million on the investment, but that’s just his 9.8 per cent share of the fall of what has been $1 billion of wealth destruction. The question is, does a huge winner like REA plus NOVA redeem a string of billion-dollar bombs? Perhaps that’s an unfair question. The skills required to be a chairman are different from those of an executive. Yes, Murdoch’s stints as executive chairman of Ten have not been successful. He has no lack of confidence to back his own judgement. It’s the judgement itself that has been questioned in the past. Arguably the investments in which he has been most successful have been those in which he has been least directly involved in a day to day sense. And that perhaps is the role of the chairman—to appoint the CEO and guide the overall strategy. The management politics at 21st Centruy Fox are too robust to allow much more than that. My personal view is that Lachlan is a nice bloke with a long history of making really dreadful calls. I would go with James every time, who has also made some shockers but seems to have learned from it. No, I’d go with Elisabeth who has made successful calls like American Idol which are every bit as big as Lachlan’s and James’ successes, and who hasn’t actually put a foot wrong. My fear is that Lachlan in the end is too laid back. In Australia in the 1990s he gave the impression of being too driven, of failing because he wanted too much to succeed, Today it looks like he doesn’t want this job enough. Perhaps this is unfair. Lachlan’s problems are not insuperable. Just very very daunting. This entry was posted in Uncategorized and tagged lachlan murdoch, News Corp, OneTel, Rupert Murdoch by neilchenoweth. Bookmark the permalink.